The Roofing Felt Art post - at last! Ah, fabulous roofing felt! (You may think of it as tar paper.) After saving (on Pinterest) some interesting blog posts about art projects done with this material, I decided, not only was I going to try out this unusual choice for an art material, I was going to teach a workshop in the process! (Nothing like putting the cart ahead of the horse, no? Well that's me.) The workshop was part of a morning of professional development put together by my region of the state art ed association (NYSATA). I am our region's rep to the state board of trustees. Anyhow, we needed a hands-on workshop as part of the day, and I volunteered. The sessions were all held at the Empire State Plaza in Albany NY, and I taught in a room at the top of the Corning Tower. This, above, was the view from outside the room where I taught my workshop. Nice, huh? That cool looking structure is a performing arts theater in the Plaza complex, known as The Egg. I will mention it again later. I must give credit where due, so, the bloggers who inspired me (and gave me further ideas and advice when contacted were Artful Artsy Amy and Beth Carter from It is Art Day. I also received a great deal of information and inspiration from Nancy Raia, who I met in the Facebook Art Teachers group. Nancy is the Community Arts Director in Fairhope Alabama. Dealing with the aftermath of an oil spill in her area, she developed a lesson that she used with kids, using tarpaper, where they created a large-scale mural as well as smaller pieces, showing marine life. When complete, the work was varnished, which gave it an oily sheen. The artwork is beautiful, and I love the idea of it having a meaning and a purpose specific to a community. Their sophisticated and lovely pieces put my silly fish painting, one of my very first samples, to shame. I did this piece before I was contacted by Nancy. The technique that had inspired me was referred to as 'soap resist'. A drawing is done on the roofing felt with a chunk of soap. It's not really a resist process, because you don't paint over the soap; you paint BETWEEN it. The painting is done with acrylic paints. When the painting is done and dry, you rinse it off in the sink, thus removing the soap and leaving the black lines. Here and those above are my first trial pieces. The turtle below was partially inspired by the pattens of molas, which was a suggested motif by Amy, and the flowers below and funky face above were me just foolin' around with paint. The silly fish pic was done to test out some metallic blue paints in the water. By the time I had completed these four samples, I had realized the stuff was terrific to paint on, and I began to experiment and explore more ideas. But I wasn't fond of the fat lines of the soap and the crumbly texture, so I used chalkboard chalk instead for the two pieces below. It also washed off just fine. I started thinking about global art possibilities beyond the mola design: Australian aborigine dot paintings on bark, African mudcloth, tapa cloth from the Pacific Islands, papel amate bark paintings of Mexico, and Native American design motifs. The roofing felt texture and weight make it feel like a good mimic of treated tree bark or leather. SO may possibilities! I experimented with birds, and with leaving a lot of black, as in the piece on the left. And I thought "why not try oil pastels?" so, using the soap, I made this silly fish. I think this might be suited to younger children and simple shapes, as it is hard to get a lot of detail on the roofing felt with oil pastels. Still, the texture gives it an interesting quality. And then I found I had a sample can of acrylic spray paint. I wrote the word 'spray' with soap, sprayed right over it, and washed it when dry. As you can see, the resist worked. I see lots of possibilities for this material with spray paints. And then, another whole wave of ideas hit me. I had been tearing the roofing felt rather than cutting it (I liked the organic shapes), so I thought "collage!". (By the way, it is both easy to tear and easy to cut.) And I made this piece below. I used tacky glue, but I believe regular Elmer's Glue-All would work fine. I was using tacky because I was about to attempt something 3-dimensional. And here it is, below, the result of my favorite technique so far. It was challenging, holding the roofing felt in place as the glue set (I had a bottle of quick-dry tacky glue, but it still required some patience). The roofing felt is heavy so really needs to set before you let go. I think this would not be suited for working with younger kids, but high school students could certainly handle it. The mask is sturdy enough that I could glue it on a wooden stake and put it on a base to have a standing piece. And I was thinking about embellishing, perhaps with raffia and beads. What fun! So back to my workshop - I taught three sessions, each with about 8 people, I think. We discussed the materials. After experimenting with soap (Amy recommended Ivory, which I found crumbly; Beth had recommended hotel bar soap) my first choice soap is Dial. (You want soap that is not loaded with lotions and oils, and is rectangular in shape so you can cut it up into chunks to write with.) I also was successful with, as I said, chalkboard chalk, and while I didn't have any, I think sidewalk chalk might be the best option. I gave both chalk and soap options to participants, and surprisingly, I think most selected the soap. The classroom smelled fresh and clean! We reviewed the types of paint used - I recommend testing to see what you like best. I had many sample bottles of various brands/qualities of acrylics, plus little bottles of acrylic craft paints, including metallics. Some colors look best mixed or under-painted with white to increase brightness. The metallic craft paints did not need under-painting. Sometimes, I like the subtlety of colors without the white, such as on my mask. Workshop participants worked on their creations in front of a David Smith sculpture (above). How cool is that? The Empire Plaza has a rich art collection and one of the three morning workshops focused on it, touring the collection and teaching participants how to teach from it. The Plaza is close enough for field trips for most of our region. Each of the participants even received a beautiful book of the collection. The third workshop was about our state organization's Portfolio Project, which is an excellent opportunity for our students. One workshop participant had this idea to tear the roofing felt into strips, paint them with line designs, and then glue them arching over each other in an interesting painted relief. Here she is experimenting. Here are some of the participants' work-in-progress. I am hoping they will eventually send me photos of their completed work after it had been rinsed. Above, starting with a line drawing and then painting outside the chalk/soap lines. Below, some lovely, loose expressive pieces. The one directly below has made nice use of the metallic paints. Ooh, I'd love to see these next two when they are complete. The first one color-wise has made me think of Egyptian art (there's another possibility!) and the second one reminds me of a complementary painting / tree drawing lesson I've done. The photo doesn't do justice to the color on this piece; it was absolutely striking! Van Gogh, I'm guessing, is the inspiration for the piece below. I like the use of the border on this cheerful piece. I can't decide if this looks more like peacock feathers or paisleys; either way it is lovely. Don't you love this adorable bird below? (Sorry he loaded sideways.) I think it will be really striking when the soap is washed and the lines are black. And this! One of my favorites! We discussed possible artist motivations - I mentioned Matisse, Leger, Roualt, Modigliani, Kandinsky, Picasso, and Laurel Burch, but I hadn't thought of Peter Max. I can't wait to see this piece finished!! Another couple of unfinished favorites, that I think have an Asian sort of feel to them. Of course, no workshop day is complete without something unexpected, right? As the third and last group was trying to finish their work and clean up, and get ready for the meeting directly afterward, suddenly the loudspeakers came on with a loud evacuation notice. We weren't sure what to do. We were told to head out on the roof/walkway to the Egg, where we waited in the hot sun, leaving behind all the work (including the pieces from the previous session that had been left to dry). Eventually, we were told we could enter the Egg, and go downstairs to our meeting in the Plaza; that had not been evacuated; it was just the Tower. I snapped the outdoor photos during that time. The first ones show all the evacuees from the Tower. So, after shooting these pics, we held our region meeting and were able to retrieve everything from the Tower afterward. The other organizers and myself, all tired and hungry, walked (oh, my feet were SO tired) down to the outside of the Plaza where there is a daily lineup of food trucks. All in all, a successful day! A quick postscript - I loved experimenting with and painting on the roofing felt so much I plan to use it for some of my own artwork. And I have one more experiment I want to do - weaving! I'm thinking of painting two pieces, cutting one piece into a loom, and cutting the other into strips for weaving. And/or maybe weaving fibers or various sorts into the roofing felt loom. There is SO much possibility here. Any more ideas? Pass them on. I still have piles and piles of cut pieces, plus the giant roll is still on my back porch, plus my husband just informed me that at our camp, we have another huge roll of roofing felt. Yeeha!! ...I'm going to do a vacation-sharing post with you! This past week we were in beautiful Kennebunkport Maine. Which means, of course, it was time for our annual family beach sand sculpture ridiculousness at lovely Goose Rocks Beach. In past years our 'best' work has included a cat/mouse standoff, a couple of dragons, an octopus, a Buddha-like cat, and an alligator. But we were stumped this year, and in the end decided on this large and silly snail, which we named Melvin. We are by no means sand sculpture authorities; we are just a family having fun at the beach. So, what Melvin lacked in sophistication, was more than compensated by his monumental size. My son, who joined us for the weekend from his home in Boston, dug the sand pile with my husband, and I did the basic design and shaping, with assistance from my son. My husband found a couple of rosehip buds that became perfect eyes, placed on top of hollow sticks, and my son shaped a piece of kelp into the mouth. Here we are with our work. Melvin surveys the incoming tide with trepidation! 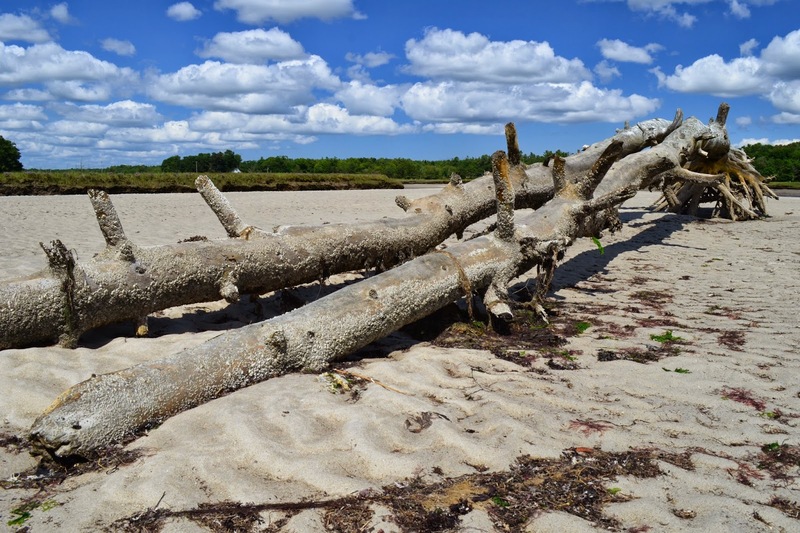 My husband and I also spent a day at beautiful Parson's Beach, where I photographed all the driftwood and the crazy blue skies (with a little help from my polarizer). Below, I caught hubby in what looks to me like a Georgia O'Keeffe moment! And then another day, on a walk through a nature preserve, we made a beach discovery, at the Wells Preserve at Laudholm Farm. First, we walked about 1/2 mile through a wetland trail. Enormous stretches of the most spectacular beach at low tide, with almost nobody there! I followed my son, also with camera in hand, across sand and tide-pools, for what seemed like miles. 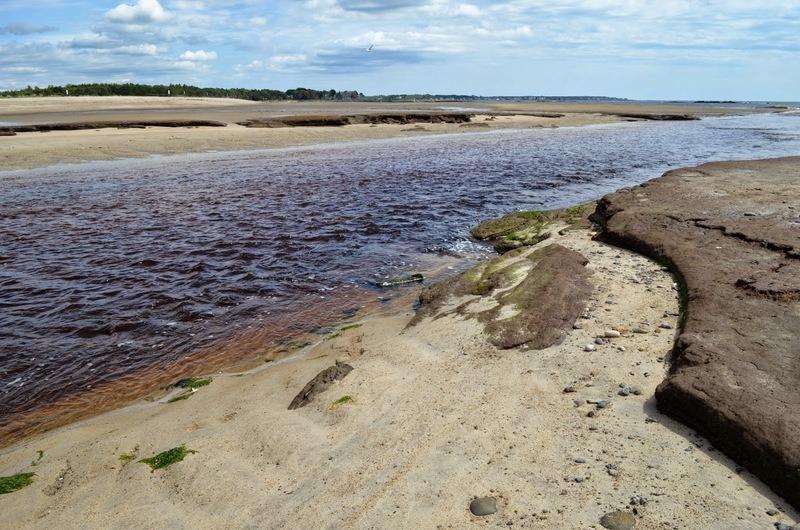 He had discovered this tidal inlet (below) that had a reddish cast to the water due to the clay underneath, I presume. That weird hunk of 'rock' on the right was actually sort of spongy underfoot. Some sort of clay formation I presume? And of course, we ate our fair share of lobsters, clams, and more, but I'll spare you from looking at photos of food. This isn't Facebook, after all. When it was threatening to rain, we spent an hour or two roaming around the Old House Parts Company, which we discovered on a rainy day last year. I took these photos there. If you ever need a doornob (they have thousands) or a door, a hinge or a window, bathtub or a sink, or any of a zillion other strange and wonderful things, this is the place to go! I'll finish this post with a view of a rainstorm over the Goat Island Lighthouse, as seen from Cape Porpoise. Next post, roofing felt! Lesson ideas galore! I promise!!!! The post that almost wasn't! - books, books book!